If you replaced your water-guzzling green lawn with barley would you be surprised if you were fined, and ordered to replant the grass? And had to go to court to fight for your rights to a sustainable xeriscape? Chris Turner, Globe and Mail columnist and author of The Geography of Hope writes about this very dilemma in Guerrilla barley growers go against the grain. What did we do differently than the Calgary artists? (This may be useful to you if you are wondering how to challenge arcane, anti-environmental bylaws.) Knowing how complicated city bylaws are, I anticipated that our plans for a green driveway might conflict with some of them. 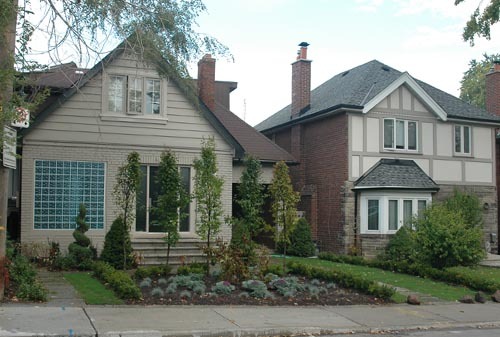 So I first did research on the Toronto.ca website to learn all about stormwater runoff and permeable driveways (which are allowed in Toronto but not North York). 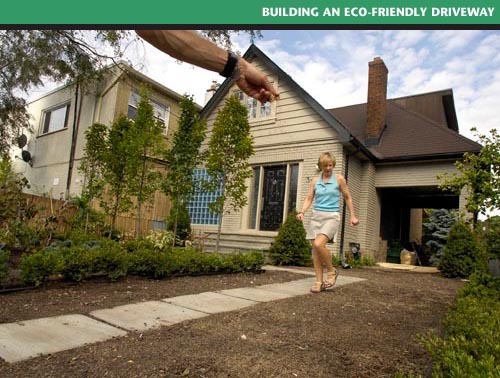 Plus I did research on green driveways and the various technologies to build them. By shining a light on it in the media, city officials were ‘encouraged’ to take another look and reconsider. In conversations with the officials we arrived at a compromise solution that we are delighted with. We won approval to be a Pilot Project for the first green driveway in our area. And then with the formal permit in hand, we built it. If we had just gone ahead and ripped up our interlock driveway, and replaced it with a green driveway, I feared that the City officials would slap a big fine on us, and we’d have to go to court to challenge it. Who needs that kind of problem? The only beneficiaries would be the lawyers lining their pockets with our money. Instead we worked with the system to figure out a solution in advance that the bylaw police could live with and that we would be happy with. I don’t buy into the thinking of doing what you want, and then asking for permission later. It can too easily backfire. And instead of being on the good side, you’ll be used as an unfortunate example of what happens when people don’t follow the rules. Take note: For those looking for signs of hope, Chris Turner will be in Toronto on Monday, Feb 18 to deliver his Geography of Hope visual tour (a narrated slide show) at the Gladstone Hotel Ballroom. Our front yard used to be interlock from edge to edge — 34 feet! Here’s a photo of the new front yard landscaping. The green driveway (10 feet wide) is on the right side with a foot path up the middle of it. The trees and plants occupy the remaining area. Many of our neighbors have told us how much they like it — and we love it. You’ve described a really good example of “guerilla educating.” (I just made that up!) What I mean is, not only did you allow the City folks to save face (by not just going ahead and breaking the “rules” and making them punish you), but you gave them the opportunity to learn something they wouldn’t have learned otherwise. It’s a wonderful idea! I only hope those trees are dwarf’s because it they aren’t, they are going to cause trouble in a couple decades. Please go to our site and add this wonderful blog to the directory, not only will we be able to share your blog with our readers, you will get more traffic.